Prada released the Prada Tendre fragrance earlier this year. It was created by Carlos Benaim and Clement Gavarry, who also worked on the original Prada fragrance, and the notes include citrus, mandarin, neroli, bergamot, maté leaves, cedar, cardamom, plum, vanilla, incense, jasmine, vetiver, patchouli leaves, sandalwood, labdanum and benzoin. Like Calvin Klein's Euphoria Blossom, Prada Tendre was developed to perform in the lucrative Asian market where heavy fragrances do not sell, and again as with Euphoria Blossom, its olfactory relationship to its parent fragrance is not entirely obvious on first sniff. Mind you, the original amber accord is still there, but it is no longer the star of the show: this is a fresher, sweeter and fruitier fragrance, and the florals are given considerably more prominence once the sharp citrus top notes fade. The base is heavier on the woods, lighter on the amber and patchouli. It is a perky, summer-y fragrance, much younger in spirit than Prada or Prada Intense, and to my nose, more girly, less sultry. It is also, as you would expect, softer. I said yesterday that neither of the initial Prada releases smelled strikingly unconventional or original, but then, neither did they smell blatantly commercial. 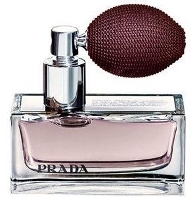 Prada Tendre most certainly veers closer to smelling blatantly commercial: it is a considerably more pleasant and less distinctive fragrance than either Prada Eau de Parfum or Prada Intense, and I would guess that it is hoped that it will capture not only the Asian market, but also a piece of the youth market in the United States. Tendre does not suit me at all — the early stages are sweeter than I like, the later stages, too soft and indistinct to be of interest. But it is a very wearable scent, and if I had to guess, I'd say it will find a much larger audience than Prada or Prada Intense. Prada Tendre is an Eau de Parfum. It is available now at sephora. Let me put on my Jean Dixon hat: I predict that you will give it a glowing review. LOL! Haven't tried this one yet. The Tendre in the name put me off. But then of course The Intense one sounded much more appealing than it was on my skin. Tendre has cardamom…maybe I should try it. I smelled it last week. Tendre is very pale compared to the original. It sounds like a Coco Mademoiselle or a Chance with a hint of calone hidden in the floral ambery formula. Why not for Asia, but for me it's too far from the Amber initial concept. LOL at J. Dixon, and we'll see if your accuracy rate is as good as hers! Have a great weekend. Oh. I actually like Prada Tendre but then again, I've only wore a tiny smidgen of it from a sample that I keep in my makeup bag. It doesn't really smell that much of a lighter version of Prada eau de parfum or intense. What I imagine whenever I smell it is not a lighter version, but the notes have been smoothed out a bit. Great to wear on a cold day in the city. But so far, I do like all three Prada fragrances. I probably wouldn't wear Prada Intense. I can see myself wearing Tendre in the late Fall. M, it is much less spicy than either of the originals, & the cardamom is pretty darn subtle. Don't think it would be your thing. Agree with all of that, including the Fifi. Completely agree that it is not just a lighter version, and “smoothed out a bit” is a good description. Interesting that you see it as perfect for a cold day in the city…I immediately identified it as a spring/summer scent, although perhaps it is too sweet for very hot weather. Oops — or the L'Homme, which is why I'm so looking forward to your review! I envision and wear scents like these for fall or winter because I guess that's how my brain associates the smell of amber and cardamon with cooler weather…. : )) Hmm.. I am going to see if I can snag another sample of this by this weekend and start wearing it now before the summer completely ends and perhaps it'll change my mind on seasonal associations!! Thanks! Hey, I didn't mean to imply that you were wrong about the seasonal association, LOL…mine is just different than yours. Do try the Intense if you go looking for the Homme, it is different enough from the original that it is worth a shot. The Tendre is *so* different that it is in another ball park entirely.